It will be nice if Nelson can come back and pitch like he did last year it be like adding a new pitcher. It's official, our 3 chasers all lost. Really disappoint in Counsell. He had a situation where he needed to go ballistic and all he could muster were some feverous arm swings. Pina did more to get tossed than Craig did. I had the exact opposite take. Knebel walked in towards the plate and the umpire left his box to confront him. Counsell saw this and immediately sprinted out yelling "Hey Hey Hey Hey!" to get the umps attention. I don't know that Knebel gets tossed there, but Craig made sure he didn't. It was a great managerial move. People are motivated by different things. 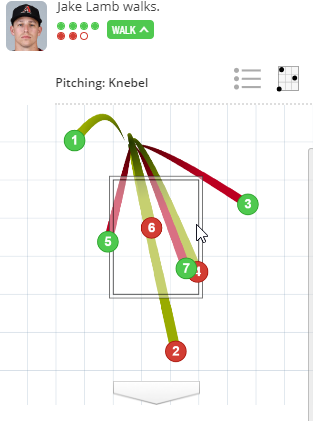 Counsell keeping his closer in the game by taking a bullet for him (or at least the obvious effort to do so) is enough to light a fire under many. Maybe jerrychochawhatever would have been pleased with feverous arm swings, accompanied by leg kicks, convulsing on the field and puking on the ump. Would that work? I like that Counsell acts like a decent human being. The whole Earl Weaver/Billy Martin tantrum is a bad look. Knebel getting tossed means some cold arm strolls into the game and promptly gives up 4 runs. It was played perfectly by Counsell. Its nice to know it's not just the homer goggles ! It was bad at the end of the game. I've never seen a guy change his strike zone so much from 1-7 to 8 and 9.
can we bring up some of the other calls earlier in the game and see where they were tracked? that is what i'm most surprised about, he was giving even more off the edges earlier. I thought the ump was doing pretty good early in the game. Seemed consistent and had some tough calls. But it could have just been the pitches I saw. I even commented to a friend about that. Of course that would jinx us in the 9th. That was a bad call. I think CC knew exactly what he was doing by jumping in. Awesome win and awesome bullpen night again!